Do I get black spots for wifi within my property? Despite having the latest router, not all properties and homes are built for the wireless signal to be carried throughout the whole building giving a strong signal throughout. This can be down to many factors including the building itself, its size and any interference or obstacles within. This can lead to blackspots in certain areas where wifi cannot reach. What options do I have to get better wifi coverage? 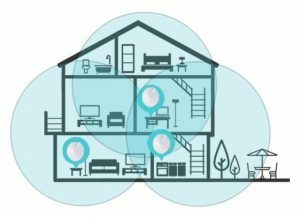 In most homes and properties, the most common ways are to use either a wireless extender or use a mesh network. Wifi extenders work by taking the existing signal from the router and boosting it further. It would need to be within range of the router unless it is a powerline based extender in order to do so. A mesh network is a more modern type of network where each “node” acts as a router itself and is placed within range of each of the other hubs, taking the wifi signal from around it covering the area whilst talking to all over “nodes” around it to create a blanket coverage within the property. 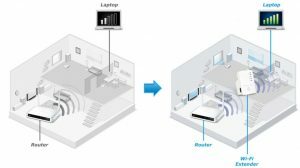 Very often it is possible to achieve better wifi coverage by means such as re-positioning your router, upgrading your router or its firmware, or just simply replacing your routers aerials. We have experience of setting up both types of wireless network for both private homes and businesses. If you would like any help with choosing which is best for you or would like one supplying and setting up then please do not hesitate to contact us. We always stock a range of different networking hardware in our Skegness computer shop.